Laura Lafond, who joined the CampusGroups team in 2011, will run the NYC Marathon in November, helping raise funds for the New York Road Runners (NYRR) Team for Kids. 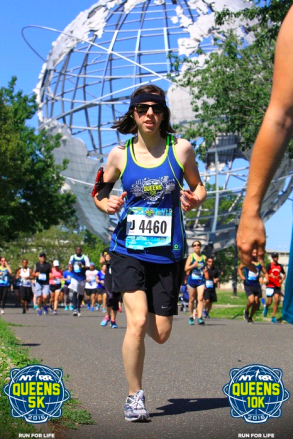 Not only will Laura be running her first marathon, but she has dedicated her hard work and efforts to helping raise funds for the New York Road Runners (NYRR) Team for Kids. The organization brings free health and fitness programs and events to children in underserved schools locally and across the U.S.
As it is our goal at CampusGroups to get students active and involved in groups and events in their communities, we are inspired by the mission of Team for Kids to build a happier and healthier future for youth nationwide. For most of the kids who benefit from TFK’s program, this is their only opportunity to get exercise or play sports. The organization makes it possible for children across the country to experience the joys of running and fitness. Funds raised by Team for Kids members support school-based programs, free youth events and crucial resources that bring enriching fitness programs to students across the country. Team for Kids funds help support programs for nearly 250,000 children nationwide, including 125,000 in New York City’s five boroughs. Since 2002, Team for Kids members have raised more than $67 million dollars. Funding helps pay for training for teachers and coaches, most of whom are volunteers, program and practice supplies, and student incentives. We are very proud of Laura and are honored to support her race! There are 13 days left to reach the fundraising goal for Team for Kids for the NYC Marathon, and we welcome our friends to contribute to Laura’s race. Any amount you can give goes a long way to helping students in need. If you would like to donate to help Laura reach her goal, please click on the link below. Q: Why did you decide to run for Team for Kids? A: I picked Team for Kids because I admire the New York Road Runners commitment and organization of this great team of volunteer runners. They are the ones behind Team for Kids, and I was convinced they are also doing a great job with these kid programs. I thought it was a perfect way to give back by helping a local and national cause as I am very grateful I was able to come to New York and find a job. For most of the kids getting access to the TFK programs is their only opportunity to get exercise or play sports. This made me realize how lucky I was growing up in France and having access to a very wide variety of sports through public school. I knew it was a good choice when I started noticing the signs for the program outside schools in my neighborhood! Q: What have you been doing to prepare for the marathon? A: I started following the amazing training program offered by Team for Kids in July. I receive it weekly and it's a great motivation as they also include some of the New York Road Runners training races and regular races. The key of the program is to include at least one interval running session, one long run (2-3 hours at the moment), and some cross training (any type of exercise that is not running). I've been trying to make the training fun by giving a purpose to the runs: run back home from our Flatiron office (7.5 miles), drop my films at a photo lab to have them developed (6 miles round trip from home), explore places I don't know when I'm traveling (follow a canal in Paris for 1 hour and turn back), spend time with friends and family by just chatting and see where the run will take us. Q: What’s on your running playlist? A: I accidentally made my own tradition which consists in starting all the races I run by listening to Other People by Beach House! The rest can be what I consider power songs so I always end up including bands like the Ramones, Parquet Courts, Yeah Yeah Yeahs (somehow all New York bands!). I also enjoy adding newly released albums I haven't had time to listen to deeply. It can also be songs I didn't know about, which can be a little quieter such as remastered demo recordings of The Velvet Underground or Bob Dylan lives. 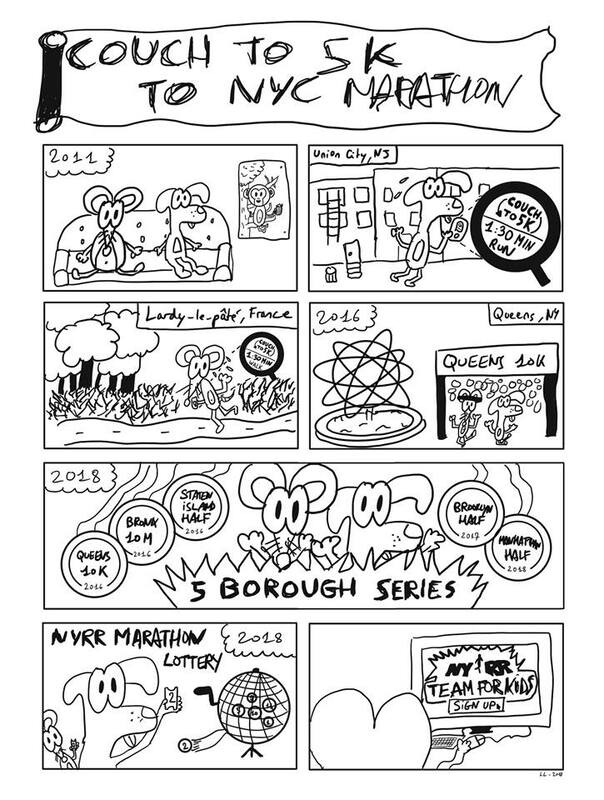 Q: Thinking ahead, where do you want to run your next big race? A: I would love to run the Paris marathon but I'm unsure if I can make it happen for next year. A friend of mine has also ran a race in Crete and told me about a marathon there, which would be such an interesting change of scenery after running only races in cities. So, why not!